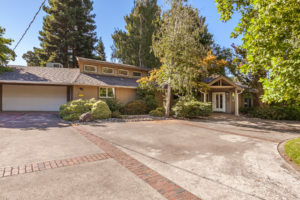 RARE OPPORTUNITY to own a special “Mid Century Modern” nestled on over half an acreage in the cool shadow of Bidwell Park! Truly a lovely home in a very special location. The “WOW” factor begins when you enter the extra-large living room, with V-shaped ceiling, fireplace and expansive views of the picture-perfect back yard. In addition to the 3 spacious bedrooms, there are TWO separate offices (one with a door to the back patio) with tons of shelving and cabinetry. The kitchen is light and airy, with kitchen island, gas cooktop, and gorgeous views of the back patio, pool and yard. And such a lush, elegant yard! Designed by local legendary landscape architect Carl Rottschalk, featuring one of the prettiest pools and patios around. Beat the heat in the cool, refreshing pebbletec pool (by Holiday Pools). The two-car garage has a drive-through to the back yard/storage shed area, and there is a semi-circular driveway for ease of access and shady guest parking. This is one home you won’t want to miss!